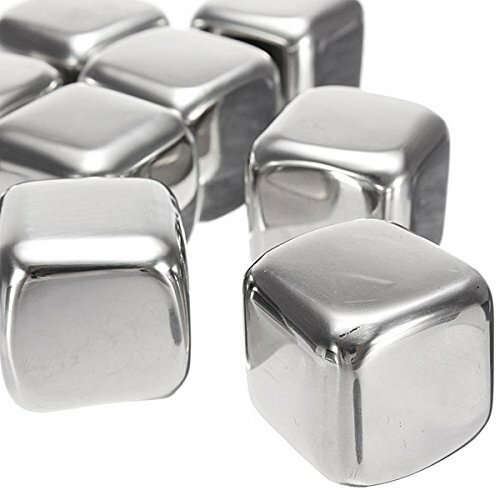 Clean the stainless cubes first and just drop them in the freezer for 1~2 hours, and then put about three pre-chilled cubes into your glass and enjoy your drinking! Is that easy! Easy to use and clean, reusable. A mini suitable box makes them convenient to carry. Each non-porous rounded cubes won't scuff or scratch your glasses. They also have no artificial taste or odor, and don't retain the flavor of previous drinks. Great for whiskey, scotch or bourbon drinker or lovers. Perfect as A New Years, Christmas, Valentine's Day, St Patrick's Day, Father's Day, Groomsmen, Best Man, Birthday or Gift Card Idea for Him - or for Your Next Cocktail Party!